I had a perfectly valid dinner plan. I had in my cabinet red curry sauce. 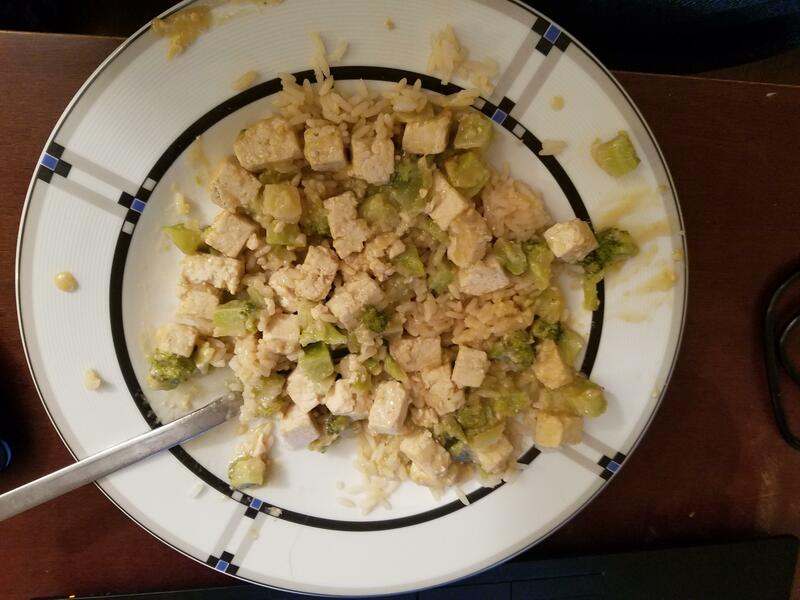 I bought cubed tofu and chopped broccoli. All I needed to do was cook the tofu and broccoli and simmer it in red curry sauce. Alas, once the broccoli and tofu were cooking, I realized the curry sauce had expired about 14 months ago. This left me to create some sort of sauce with the contents of my kitchen, which are sort of random. I had a can of lite coconut milk. I located soy sauce and some spicy cooking oil. I threw all of that in. The sauce was sort of meh. I remembered that on Top Chef they always say that dishes need acid. I don’t know a lot about which foods have acid, but I knew that lemon juice would. Unfortunately, I had no lemon juice. I did, however, have lemon-flavored rum. So, I threw that in too. At this point, I had thrown in so many liquids that I was looking at tofu and broccoli soup. I knew I could boil some of that off, but that could take ages. I recalled that flour is some sort of thickener, so I threw a couple of tablespoons in. After more cooking time, it had thickened enough to be reasonable. I threw the whole mess over some rice. The final product is pictured above. It was as mediocre as you would expect.